The New York Auto Show just got a lot more interesting, with roadable aircraft maker Terrafugia confirming the premier of their Transition street-legal aircraft production prototype at the show. Popular Mechanics is going to crap themselves with joy. It's really happening, guys! 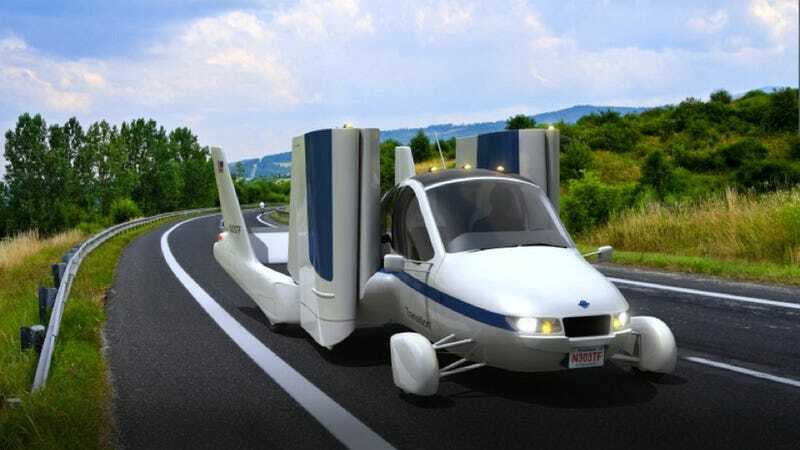 Terrafugia has slowly been going through the steps needed to make a true flying car for what feels like forever, making its first flight, getting necessary FAA exemptions and approval. The next-gen pre-production prototype of the car will be on display for the press and regular show-goers alike. That they're finally making a big splash at an auto show is, hopefully, a sign that they company is closer to production. "We selected the New York International Auto Show to continue the roll-out of the Transition because of the value this show brings in terms of exposure to future owners, investors, and partners," said company COO Anna Mracek Dietrich. "The NYIAS is a venue from which we can show the first practical street-legal airplane to the world while meeting the people who will be part of its commercial success in the years to come. New York is the perfect place to accomplish all of this." OK, that's not as committed of an answer as we'd like to hear. Better put it back in your pants Pop Mech.